The 7W rollable is the perfect portable solar solution for waterlogged environments when you need to keep small electronics powered-up, or you want to supply a trickle charge to the battery of a boat without worrying about the water. 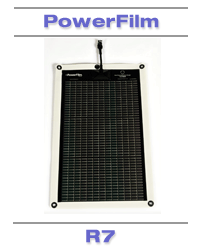 Unlike other thin-film solar technologies, PowerFilm solar chargers do not need to be "sun soaked" after storage to produce peak power; you have critical power to moment you need it. 1.•Place the charger solar-side up in the sun. 2.•Connect the charger using either the female CLA or 15' O-ring terminal extension cord (both included) to your device or 12V battery. 3.•Note - unlike the USB+AA and AA solar chargers there is no storage mechanism, meaning the charger will only produce DC power while in the sun.